You are currently browsing articles tagged Misc. After a few days of unbearable heat in my classroom (no air conditioning in my school), I decided to quantify my misery. 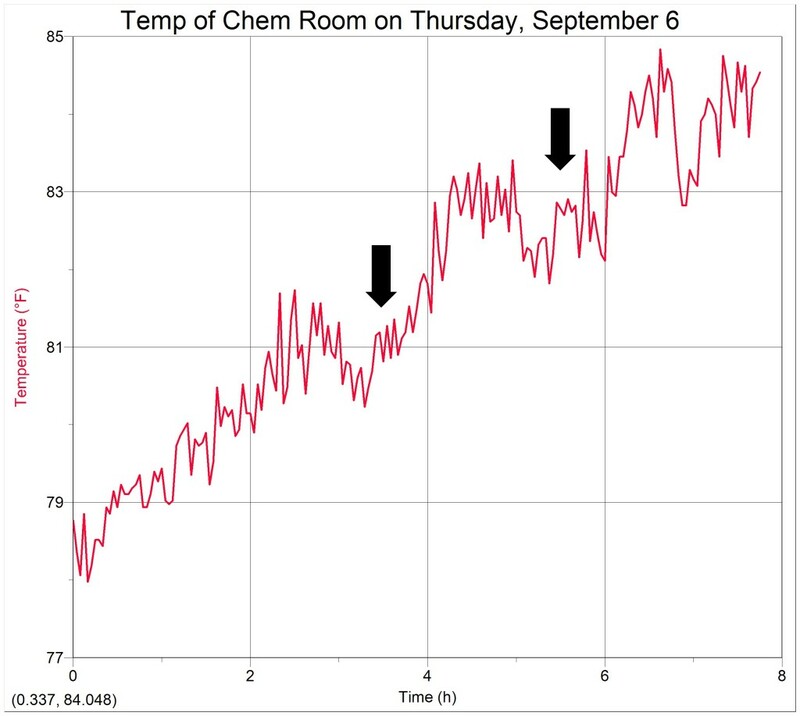 My room got hot – up to 85ºF, which was actually cooler than the day before (~89 ºF). Our district touts equity, but seeing as the other high schools in our district both have air conditioning, I can assure you that the district is NOT equitable in providing a classroom environment conducive to learning. The other interesting thing is that there is a noticeable change in room temperature when the kids are physically present. Notice the two dips in temperature (marked by the arrows). They represent two hours the chemistry room is vacant. Thus, body heat can significantly raise the temperature of any classroom. Keeping these two things in mind, I have a suggestion to maintain ‘equity’ – keep rooms cooler in non-air conditioned buildings with lower class sizes!